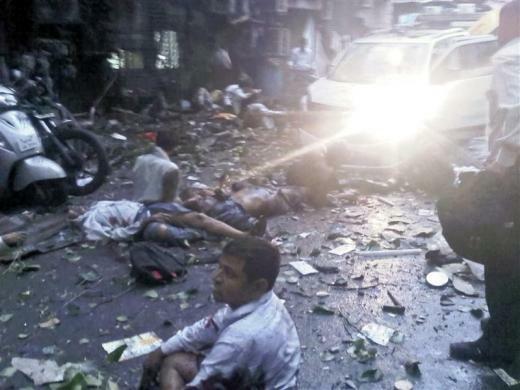 The new series of bomb blasts - two in South Mumbai and one in central Mumbai - is going to open all the wounds again. First blast took place at the crowded Zaveri Bazaar, within short time blasts rocked Opera House and Dadar too. The point to be noted here is, these blasts took place just two days after the fifth anniversary of 2006 serial train blasts in Mumbai. Although authorities didn't confirm any links between them. This is not the first time terrorists are targeting India's financial capital. Mumbai was the target of multiple bomb blasts in the past too. Targeting a major Indian metro will provide several incentives to the terrorists - it will help them to stamp the city as unsafe for business, more attraction in local and international media, creating confusion and panic among the citizens. Not only that, these events will create confusion among government circles too as they will be forced to act quickly and decisively; after all people are expecting their government to do something. This moment calls for national unity and remember us about the necessity to be on alert around the clock. What happened to our coordinated anti-terrorist strategy? Tragedies like this reveals the importance of various government agencies to coordinate with each other, share information and come up with a joint strategy to face the threat. Remember that after 9/11, terrorists are yet to strike US mainland, after 7/7 London too didn't face any similar situation. Close calls were there, but authorities were able to act in time and fail those attempts. It is true that in India situation is entirely different, we are close to the base of many terror networks. Over and above Indians and Indian cities are always hit list of various terror groups. In a country of 120 crore people it is difficult to track down various terror elements operating against the nation, but it is precisely the task awaiting for intelligence agencies. They have to penetrate these networks and foil the plots in the beginning itself. To achieve this we have to redefine the role of intelligence agencies, it should have the capability and access to all the modern equipments. Along with this government have to form small groups capable of executing covert operations in land, sea and air. The spirit of India will never be down and Mumbai will be back in business with in no time. Do we really need a separate Rail Ministry?